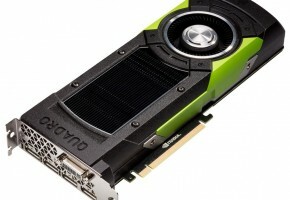 In just two days NVIDIA will host a press event in Las Vegas during Consumer Electronics Show 2015 (CES). The event where new visual computing technologies will supposedly be shown. We’ll reveal the latest chapter at our event. 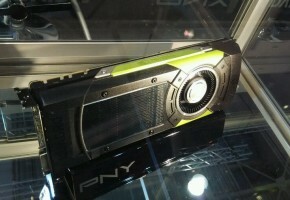 You can follow all our news from CES at www.nvidia.com/ces2015. And you can watch our keynote address Sunday at 8 pm Pacific time on our blog. Bookmark it now, but that page doesn’t go live until show time. Okay, so what is this event all about? The correct answer is: we don’t know, but we have a clue. There’s a new leak about Quadro M6000 graphics processor. Few months ago I told that eventually NVIDIA will release a new Maxwell-based Quadro series. I even gave it a name, Quadro M, although I still find it confusing if we consider Mobile Maxwell parts (etc. M6000M). Quadro series were recently updated with Kx200 parts, which were all based on Kepler architecture (except K620 with GM107). Thus almost all cards from original Quadro K series were replaced with faster Kx2 variants, all except K6000, which was already equipped with the full GK110 processor. However, Quadro K6000 will soon be replaced by the first ‘proper’ Maxwell successor, the M6000. 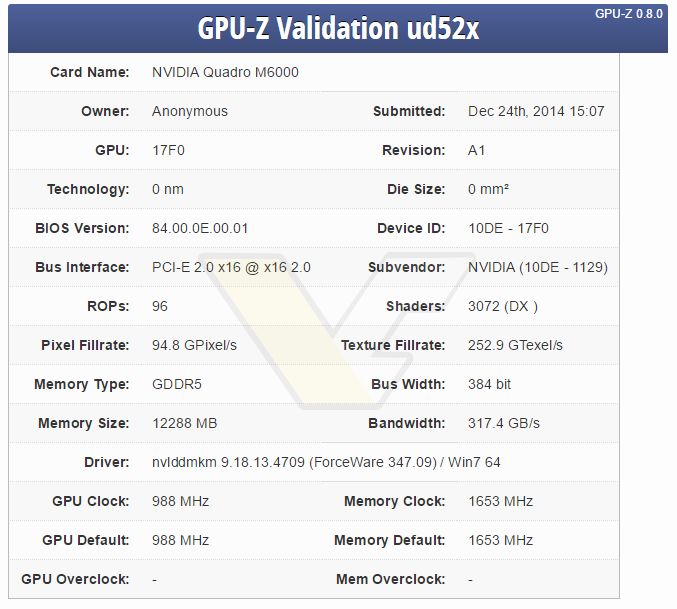 The leak came from GPU-Z validation, where we found almost full specifications of a mysterious GPU codenamed 17F0. The GPU in question is without a doubt the Big Maxwell, as there is no processor occupying this ID slot as of yet (the family of 17xx IDs to be precise), and there is no GPU with 3K cores. Whether this is the full variant, we don’t know yet, but we do have some very interesting pieces of information. First of all GM200 would sport 3072 CUDA cores (that’s 24 SMMs, GM204 has 16 SMMs). The core would be equipped with 96 ROPs, and 192 or 256 TMUs (the data from GPU-Z suggests 256, but unless Maxwell architecture changed, we should only expect 192). Moving forward to memory configuration, we see the interface of 384-bits. The Quadro M6000 has 12 GB GDDR5 memory and a bandwidth of 317.4 GB/s. The bandwidth is quite good (better than K6000’s), although it still falls behind GTX 780 Ti’s with 336 GB/s. Of course NVIDIA is quite possibly using the same color compression algorithm in GM200 that we have in GM204, so these values are incomparable. Besides, GeForce graphics cards based on GM200 silicon should feature higher clocks. The Quadro M6000 is expected to launch this month, with a strong possibility of appearance at CES 2015, even in form of PowerPoint slides. We will update you once we learn more. Happy New Year to everyone!.